The poster features a woman wearing a burqa with a striking red strapline saying: “Uncontrolled naturalization? No to facilitated naturalization.” A committee co-led by Andreas Glarner, an MP from the country’s largest political party, the Swiss People’s Party (SVP), commissioned the poster to oppose a facilitated naturalization bill before it goes to the polls next month. “The burka is a symbol of the lack of integration,” Glarner told 20 Minuten. The bill stipulates that the relaxed regime should only be available to those under age 25 who have attended school in the country for at least five years. In addition, at least one of their parents must have lived in Switzerland for a minimum of ten years and at least one of their grandparents must have been born in Switzerland or have been granted permanent residency. Mass naturalizations would entail “harmful consequences for Swiss culture and identity. The overpopulation of foreigners and the massive increase in the number of Muslims would change the very essence of Switzerland, along with our society and its values,” the committee warned in a statement. “Switzerland’s integration capacity is exceeded in many places in the face of mass immigration of over 75,000 people in net figures, and some 40,000 naturalizations per year. In 2014, the Swiss Federal Statistical Office officially counted 338,000 Muslims over the age of 15 in Switzerland. If the under-15s are added, there are about 450,000-500,000 Muslims living in Switzerland. Nearly 35 percent of them already have a Swiss passport (marriages, naturalizations, converts),” the Committee stated on Monday. According to 20 Minuten, the controversial poster is the brainchild of the same firm that designed another SVP poster last year to campaign for deporting foreign criminals, which featured a white sheep kicking a black sheep off the Swiss flag. The burqa, niqab and other forms of Islamic head coverings are a controversial issue in Europe, often seen as being incompatible with secular or Judeo-Christian values and an obstacle to integration. 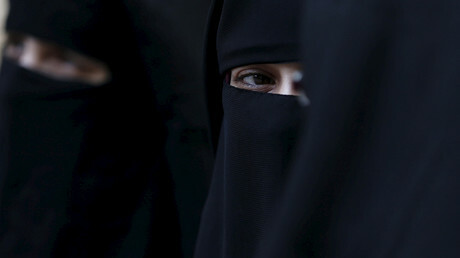 France was the first to impose a ban on full-face coverings in 2011, citing the principle of laïcité or secularism, followed quickly by Belgium. Despite protests and legal challenges, the ban was upheld. Islamic teachings state that women must dress modestly. However, while the majority of scholars agree that the hijab, or headscarf, is obligatory, few say that means women must cover their face.